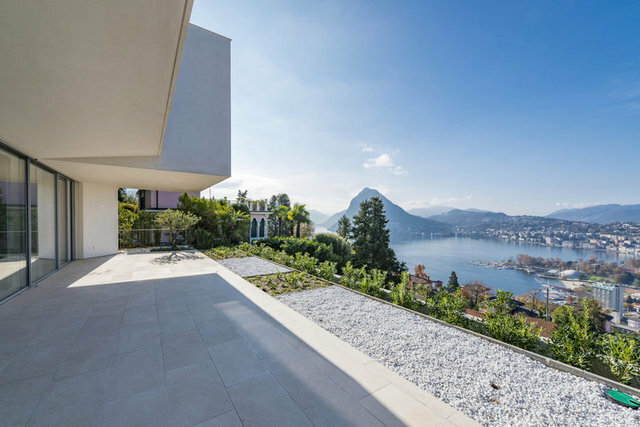 Villa "Bellavista" is located on the hillside of Monte Brè, in an exclusive area which offers a magnificent panoramic view over the lake and the city of Lugano. Designed by the famous arch. G. Camponovo is studied with attention to details for the maximum comfort. High quality materials used for the internal fittings. Access to the villa with a private elevator. Ground floor: large living room (200 sqm) with fireplace and kitchen space, guest bathroom, garden (150 smq) with possibility to build a swimming pool. First floor: 3 bedrooms, walk-in closets, two bathrooms, terrace (80 sqm). 3 parking spaces in the garage.